Annette Barbier will present a short video entitled “Approach, 2012”. A 2:12 minute work created with Drew Browning. It is a tale of the cycle of meeting, intertwining, and separating relationships. Nancy Bechtol will present “Chief Thundercloud” as told by Hilda Williams and friends. This 22.30 minute work was excerpted from 1.5 hr interview. 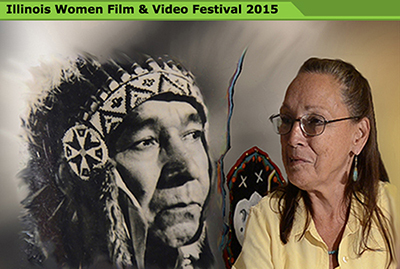 Hilda Williams (Little Fawn) tells the story of her father, Chief Thundercloud, (b. 1898. Ottawa) the first Tonto on the radio, and known for his presence at the Olsen Rug tribute to Native Americans with deep ties to Chicago and the American Indian Center. for a farming family. They decide to take a year’s sabbatical in Japan. Jean Sousa will present a new film “Alvaro”. It is from a series of films based on poems written by her late Aunt Alice.The new work is 6.50 minutes in length. Dr. Dorene Wiese with Louis Delgado and Charles Celander Louis produced “Chicago Has always Been Indian Country” with the Chicago American Indian Community Collaborative. This 6.0 minute work highlights the Chicago American Indian community which is virtually invisible in Chicago. The collaborative felt they needed to develop a shared, comprehensive vision for American Indian improvement. This brief history of American Indians in Chicago shows the earliest inhabitants of this land and how they are still living here.